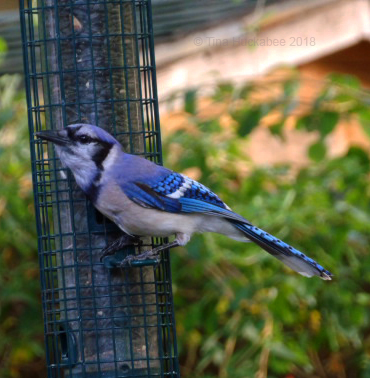 This entry was posted in Biodiversity, Blue Jay, Cardinal birds, Cardinalis cardinalis, Four O'clocks, Libellula croceipennis, Moths, Northern Cardinals, Red-bellid Woodpecker, Uncategorized, Wildlfie, Wildlife Gardening, Wildlife Wednesday by Tina. Bookmark the permalink. The moth is probably some sort of tree moth, with that pattern – usually very well camouflaged on tree bark. We have a lot like it here in the UK. I love the way the female (?) 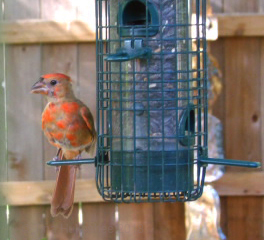 of the Cardinals has a red beak while the male is fully red, and the youngster is sort of a sort of patchy version of both! The parakeet-like thing is a blue budgerigar (commonly referred to in the UK as a budgie). Yes, I imagine you’re right about the moth. 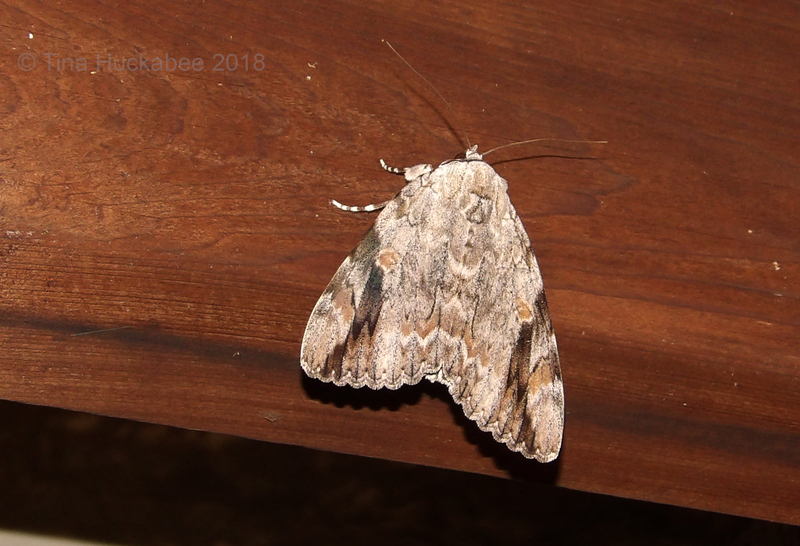 There are quite a few of these kinds of moths, I just couldn’t find an exact match for it as I looked through my usual sources. I did send a photo to Butterflies and Moths of North America and they’re usually good about getting back; I’ll update if I hear from them. The Cardinals are color-coordinated, aren’t they? I know that the blue parakeet is called a budgerigar–budgie in the UK. I’ve seen one or two of the blues in the flocks of Monk parakeet and I hope the one in my back garden was one of those, rather than someone’s lost pet. Thank you–it’s certainly a more sober day than in the past. Each Independence Day, National Public Radio has a recitation of the Declaration of Independence and I always find it moving. This morning, I felt very sad listening to it. Things will change. May take time, but they’ll get better. Many of us (myself included) are working hard, hard, hard to fix this mess we’re in. Haha! 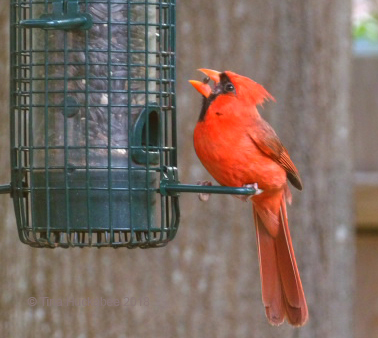 I love that–creamsicle and it really does describe a female cardinal. Junior is smoothing out his coloring though, I just saw him today and he doesn’t quite look the mottled mess that he’s been. Tina congratulations on Independence Day. Your photos are magnificent I love them all. 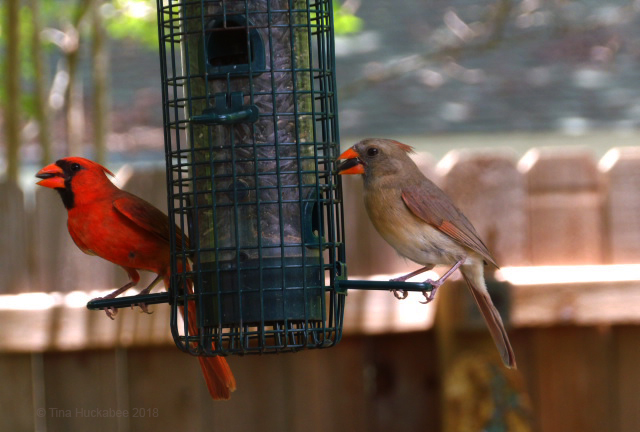 The Northern Cardinal, his lady and his children are adorable. 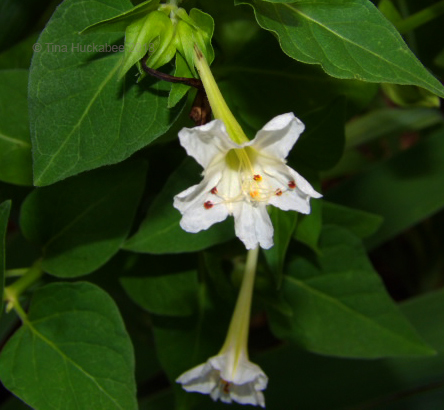 The white flower Mirabilis jalapa is beautiful. The Blue Jays are lovely. The Neon Skimer is divine. The unidentified nocturnal moth is very beautiful. They are all wonderful. Live Wildlife !!!! Tina that does not get too hot. Take care. Greetings from Margarita. Thanks, Margarita. I enjoy watching the birds and other critters around here and am glad when I get some decent shots. It’s been very hot here, but today, we had rain in the afternoon, so that was quite nice. A very creative 4th of July post! We once had a parakeet in the yard for a few weeks. It was very frustrating to the other birds, as it did not understand pecking order. Thanks! Truthfully, I’m having a hard time blogging, I just don’t quite have the interest, so I was glad to come up with a post that someone likes! Interesting about the parakeet; I’ve only had them visit very briefly. Happy Independence Day from Australia. I enjoyed reading your red white and blue post. 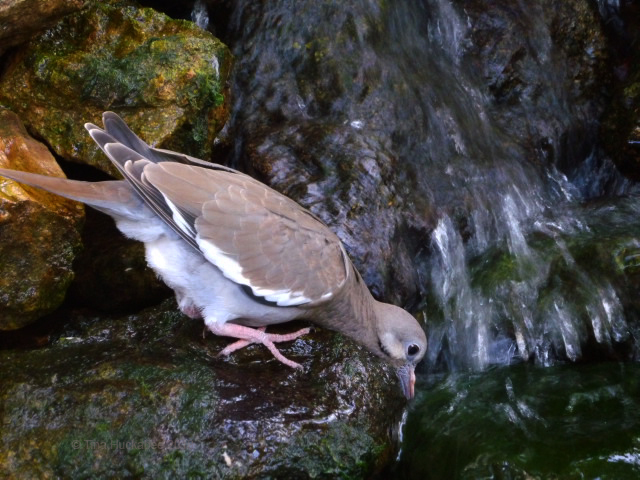 They are beautiful birds that visit your garden. Thanks so much, Jane! We really are very lucky here in Texas to have a wide variety of birds native to our area, plus those who migrate through in spring and fall. Thanks for reading! I’ll never tire of seeing your Northern cardinals, they are just so amazingly red (OK I am overlooking the females, but still…). The poor juvenile males look like they have chickenpox though! Glad to hear your boy is gradually coming together. Do your blue jays wait on you putting the peanuts out? Cardinals look so unreal. I have see only one while in Oklahoma. It seems odd that a bird would be so brightly colored, and so uniformly so. They’re gorgeous! But so are Scarlet and Summer Tanagers–also solid red (or rather, the males are red). Yes, but they do not look like they have the attitude of a cardinal. The cardinal is so bold! It’s the crest–it gives a bird such a jaunty air! I’m really curious about that reddish-pink, almost gaura-like flower in your header. I have a photo of something similar that I haven’t been able to identify. What I can identify are bluejays, and I have a lot of those. They’ve been around since about November, and there have to be at least three family groups stopping by for peanuts. The woodpeckers always delight, of course. I spotted one that looks like yours, except there’s not a bit of red on its head. The poor thing looks bald! 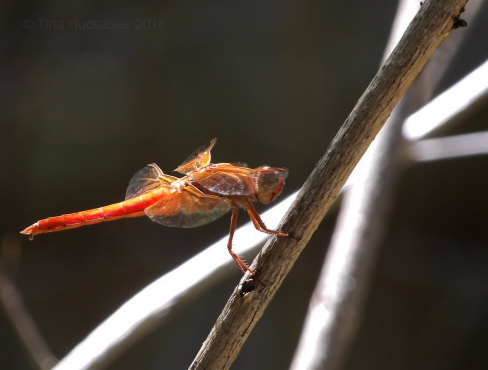 I’ve assumed it’s a juvenile, but I just haven’t looked it up. I’ve identified some flowers recently thanks to a new field guide that’s come out. It was reviewed in the last NPSOT newsletter; it’s Michael Eason’s Wildflowers of Texas. It’s the most useful book I’ve come across. For one thing, it covers all the ecoregions of the state, so I can carry it with me to the hill country, the coast, and so on. It’s beautifully organized by color, and by genus and species within the colors. A nice touch is the way they’ve made each color section visible by edging the pages in that color, and bless their hearts, they put a six inch/centimeter ruler on the back — with a nice, laminated cover. Even better, each page has three photos and descriptions, so you can compare multiple species from a single genus at a glance. There’s nothing like having six species of coreopsis spread out in front of you. Can you tell I’m enthused? I’m glad you got some rain, and I hope your Independence Day was great. Tuesday night my area got about four inches, and of course Houston got doused on the 4th. The good news is that the rain continued on down the coast, so some of the refuges may have a bit of water in their ponds. The rain was glorious, the coming mosquitoes–not so much! I got just under 2 inches, so that was a nice Independence Day gift. The book sounds great–I really need a guide like that. I use my phone, but I’m still fond of things with paper. 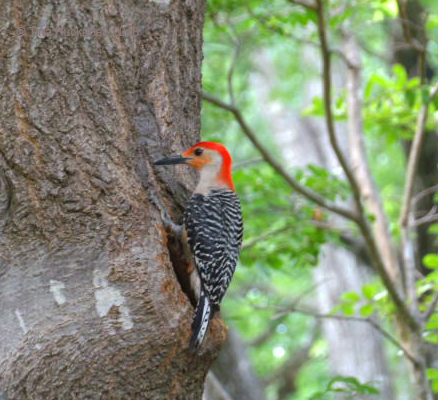 I’m seeing more woodpeckers this summer and I never see them this time of year. Today, I saw a little female or juvenile Downy–just briefly–at my tube feeder (which is all I put out in the summer, peanuts excepted). I just love the Down woodpeckers, but they sure are hard to photograph! Lots of hummingbird action this summer–I’m thrilled about having so many (or maybe it’s just one or two really active ones). The flower is the stalk of a Red yucca (Hesperaloe parviflora). It’s a photo from several years ago, but they are in their prime now. You have parakeets!!?? How fun is that! They aren’t native to this area, but are descendants of released pets. Apparently, they don’t negatively impact other wildlife, but because of their huge nests built connected to electricity transformers, they have been responsible for some fires. As for the blue budgie, I don’t know if he/she was someone’s lost pet or a blue member of a bigger monk parakeet group. It is fun to see them, I have to admit! A great collection of photos Tina, creative tie in with your Independence Day too! It was funny for me to see your pic of the budgie. 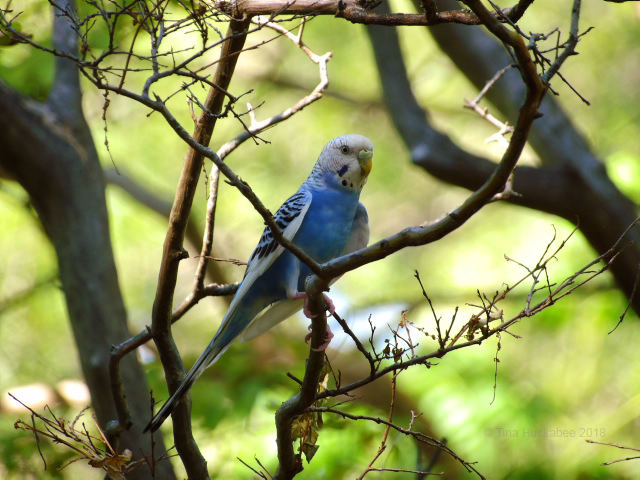 Budgies are commonly called parakeets outside of Australia but they are the one and the same. A native bird here in Aussie, but also a popular pet here and overseas. I even had a blue one named Zoe when I was younger, she never spoke but was a great whistler! I think the blues are so pretty–it was fun to seen it in the garden, though it didn’t stay long. Fun that you had one as a pet–I believe they can live quite a long time? Mine only lived for about 5 years, but I think they can live to 10 years. We have monk parakeets in Chicago as well — hard to believe they can make through the winter. We used to see them around the garden but not in years. Interesting, and yes–your winters aren’t to be trifled with, so it’s amazing that they survive! Awe–that’s nice. I love it when I find (or see!) bees and their circular nibblings.